Today was yet another beautiful day in Haiti. After a long day of traveling yesterday, everyone went to bed early and got a substantial amount of sleep. We had oatmeal, pancakes, and eggs for breakfast. At 9:00 we boarded the Tap Tap to go to Gertrude's Home, also called Notre Maison Orphanage. There are 48 kids who live there, including kids with special needs. 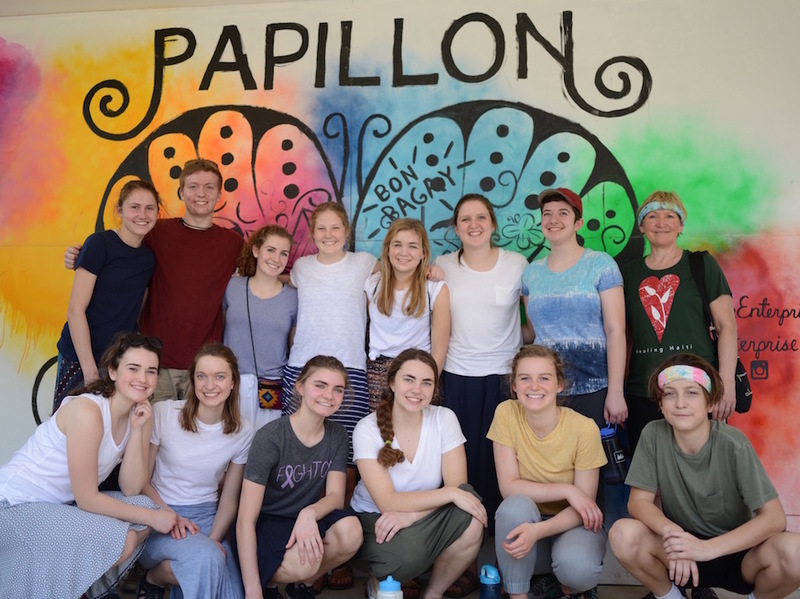 Gertrude's Home was founded in 1993 by a woman who was determined to help those with special needs who are often forgotten or pushed aside in Haitian society. Many of the kids were at school today but some of the kids were there for us to play with. We brought a parachute, markers, bubbles, and musical instruments that the kids enjoyed playing with. 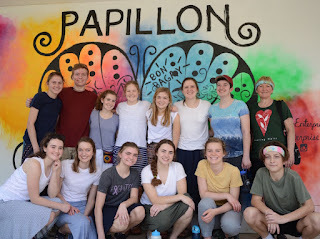 Next, we went to the Apparent Project that is partnered with the organization Papillon. This non-profit organization is driven by the mission to provide jobs to parents who are struggling to provide for their families. The parents/workers produce mugs, bracelets, necklaces, pillow cases, bags, dolls, and many more items. We also shared a couple of pizzas with smoothies and all of our purchases went to this amazing organization. Our final stop of the day was to Dari's. There are 28 children with special needs and this orphanage is run by Father Dari. We fed the kids and had fun drawing pictures with them. When we arrived back to the compound, we had chicken yakeisoa with rice which was extremely good. After another delicious meal, we went to the soccer area to play with the neighborhood boys. We soon decided to just watch, as the boys were much beyond our soccer skill level. Lastly, we had prayer and listened to Grace (a manager of Healing Haiti) sing and play the guitar. We spent the rest of the night reflecting, playing cards, writing in our journals, and seeing Mr. Dols (surprisingly) win every round of Bananagrams. It was another day filled with smiles, laughter, and new experiences.